very tricky illusion..really nice one..
they look like different colored blue backrounds, maybe it has to do with that??? You are comparing the edges which face each other. The left edge of the right image slopes more than the right edge of the left image. how did he do it??????????? This is a good one. There are no camera or background color tricks. The illusion is that when two (or more) identical leaning or receeding objects are placed next to each other, the object the furthest out appears to be leaning the most. When in fact they are all identical. 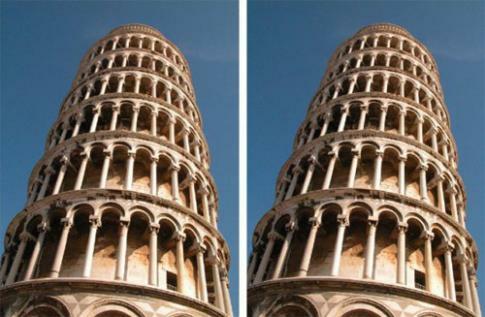 There totally right the leaning tower on the right appears to be leaning more than the leaning tower on the left. If you cross your eyes it's 3d. i did not need to read it i saw that the left was different than the right.